Dana is a second-career attorney. Prior to entering the legal profession, she worked extensively for a large telecom corporation where she held many positions, including business manager and project manager. Through her prior work she developed the valuable skills of problem-solving, managing deadlines, and breaking-down complex matters into an easy to understand manner. 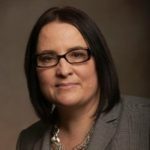 Her practice focuses on civil litigation representing individuals and companies, with a primary focus on the areas of insurance coverage disputes and construction defects. She has successfully represented clients at motion hearings and trials. Before joining Sauro & Bergstrom, PLLC as an associate attorney, Dana clerked for Hennepin County District Court Judges John Q. McShane and M. Jacqueline Regis. While working at the district court, she worked on hundreds of civil cases, including researching and drafting numerous civil memorandum and orders. When she is not practicing law, Dana enjoys knitting, motorcycle riding, and making hand-made chocolate truffles.